The Digital Research Library of Illinois History Journal™: The History of Chicago's Air Quality. Like most large cities, Chicago has a history of poor air quality. As it industrialized, Chicago relied on the dirty soft coal of southern Illinois for power and heat. Burned in boiler rooms, locomotives, steel mills, and domestic furnaces, the ubiquitous coal created an equally ubiquitous smoke. Soot soiled everything in the city, ruining furniture, merchandise, and building facades. Chicago legislated against dense smoke in 1881, but residents and visitors continued to complain about choking clouds and filthy soot. In addition to smoke, the numerous industries surrounding the slaughterhouses produced foul odors and dangerous chemical emissions, further diminishing air quality. Coal burning steamer on the Chicago River. Undoubtedly the poor air increased the severity of several pulmonary diseases, including asthma and pneumonia. Perhaps second only to Pittsburgh in smoke pollution at the opening of the twentieth century, Chicago gained a national reputation for its terrible air, but it also became a leader in regulation. 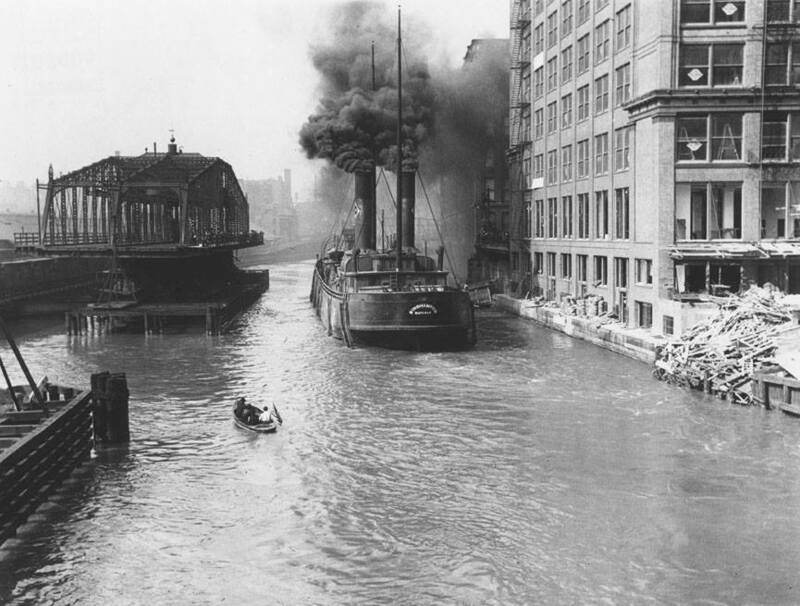 In the early 1900s, a movement to force railroad electrification focused on the Illinois Central's waterfront line and kept the smoke issue in the news. Still, air quality did not significantly improve until coal use began to decline after World War II. In the early 20th century, private, single-family, two and three flat residence were instructed to burn their waste in the small concrete garbage incinerators that the city constructed in the alleys behind each property as a solution to growing landfill issues. Garbage trucks would open the cooled incinerators and shovel out the ashes. Larger incinerators used by schools, hospitals, and apartment buildings. In 1959 the city created the Department of Air Pollution Control. The new department investigated all types of emissions and suggested regulations for several previously ignored sources of pollution, including burning refuse and leaves. Public concern for air quality heightened after a 1962 disaster killed hundreds of London residents, and by 1964 Chicago received more than six thousand citizen air pollution complaints per year. As with the early movement to control smoke, the new activism focused on the potential negative health effects of impure air. Not surprisingly, the Loop, the Calumet Region, and northern Lake County, Indiana, were the most polluted districts in the metropolitan area. In 1967 the U.S. Public Health Service determined that only New York City's air was more polluted than Chicago's. Impelled by citizen activism and new federal regulations in the 1970s, the city attempted to control the largest polluters, including the massive South Works steel plant. Even as these efforts began to reap benefits, however, the continuing suburbanization and auto dependence of the metropolitan area meant that auto emissions would plague the city for decades to come. By the 1990s, a decline in heavy industry and effective regulation of auto emissions combined to significantly improve Chicago's air. Chicago no longer ranked among the nation's most heavily polluted cities.